Hotel Imperium, the first and certainly the most spectacular and extensive hotel project conducted in Bucovina, is characterized by the majority of its guests as a true example of good taste and refinement. The "Imperium" arose in 2007, when a reputable and ambitious team of architects and designers have sketched what was to become the first 4-star hotel in Suceava area. The project was born from the desire to reward aspiration inhabitants of this unique region of Romania to have a representative hotel with which to identify, but to overcome the common style, banal and familiar to other accommodation at that moment in area. I express our satisfaction for the standards and the hospitality in this hotel Imperium , which is a jewel for the historic city of Suceava.I would recommend it warmly for my friends visiting the upper north of the country! Thus, from the desire of Bukovina, after hard work , the initiators of this project, together with the team of architects and designers have succeeded in record time, at 15 March 2009 to inaugurate the first hotel 4 star hotel in Bucovina - Hotel Imperium. The stunning result was characterized in unison as pure evidence of greatness, but also of simplicity and sobriety, this successful recipe values being provided practiced and promoted by the ancient civilizations, but mainly by Roman civilization, which is otherwise the main source of inspiration of the developers "Imperium". The name appears to have a connotation that can symbolize taxes grand building of the Roman Empire, with massive walls, solid, facing centuries, all of a monumental character. This is the style Imperium, one unique to the area, who followed but "canons" ancient classical models facades balanced, proportionate and novel in style. 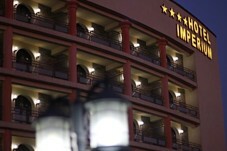 Currently, about Hotel Imperium can say unequivocally that has unquestionable reputation of authentic 4-star hotel, the evidence in this respect the "plethora" of personalities and celebrities who step into the hotel and was impressed by the good taste , hospitality and sophistication found. We only mention some of the big names because the list is very long: Victor Ponta - actualy Prime-minister of Romania, Adrian Nastase - former Prime-Minister of Romania, Mircea Geoana - former President of Romanian Parliament, Elena Băsescu - former EU Parlamentar, Sorin Oprescu - actualy mayor of Bucharest, and a lot of distinguished ambassadors, like Greek Ambassador, Norway Ambassador, Iran Ambassador, South Koreea Ambassadors, and many others. We spent a couple of days at the beautiful city of Suceava and we enjoyed the hospitality af nice staff of Imperium Hotel at the entrance of the city. I wish them all the best! Structured over 5 floors, Hotel Imperium provides hosting for its guests in 80 rooms, 8 suites, also decorated in Roman classic style. 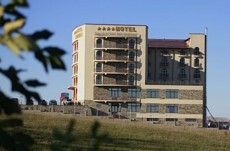 Once accommodated at Imperium, guests will benefit from the cheapest prices for 4 stars accommodation segment in Suceava. The city panorama for the guests, it is unique in the hotel rooms being able to enjoy a view showing much of the city of Suceava, including the ruins of the medieval fortress or the towers of the numerous monasteries from the historic city. Also our guests in the hotel can organize various events, from conferences to business meetings or wedding parties. For all of these were built 4 restaurants with 350 seats, 200 seats, 100 seats and 50 seats. Thanks for the inspiration to choose us, we assure you of our special appreciation and you are welcome anytime!